Best known as founding member and lead guitarist of Journey, Neal Schön has enjoyed a remarkable career as one of rock n’ roll’s top virtuosos, with a hand in creating some of the most popular songs of all time. Beginning his career more than 35 years ago in the San Francisco Bay area, the 15-year-old guitar prodigy left home to join Santana. Schön moved on in 1973 to form Journey. With Journey and other projects, he has earned 19 Top 40 singles and 25 platinum and gold albums, was awarded the prestigious “Legend Of Live Award” at the 2011 Billboard Touring Awards, received a star on the Hollywood Walk of Fame in 2005 and was individually inducted into the Oklahoma Music Hall Of Fame in 2013. As the only member to record on all of Journey’s albums, Schön continues with the band today in its latest incarnation. In addition to 6 solo albums and 14 studio albums with Journey, Neal Schön has also performed with Joe Cocker, Sammy Hagar, Paul Rodgers, Larry Graham, Betty Davis, Michael Bolton, fusion legend Jan Hammer, Hardline and supergroup Bad English, as well as a variety of side projects. His latest instrumental solo album, THE CALLING, released in 2012 via Frontiers Records, won rave reviews from fans and the media alike, with Vintage Guitar declaring “THE CALLING is a fine piece of work demonstrating that Schön still has it going on – and then some…The songs are strong and his guitar tones are absolutely luxurious.” In demand as one of the leading guitarists of his generation, Schön uses custom-built PRS Private Stock Neal Schon guitars, made especially for Neal by world-acclaimed Maryland guitar manufacturer Paul Reed Smith Guitars. The album can be pre-ordered now via iTunes,Amazon and via the Journey online store; fans who buy SO U now via iTunes will receive “Exotica” as an instant-gratification track. Schon fans and guitar aficionados might want to take note that as an endorsee of Paul Reed Smith Guitars, Neal has had the opportunity to collaborate with PRS to design his own signature model guitar, the PRS NS-14 guitar which is available through authorized PRS dealers and distributors. About PRS Guitars: Paul Reed Smith Guitars is a leading manufacturer of high quality instruments in Stevensville, Maryland and has provided some of the world’s most renowned musicians with instruments since 1985. The PRS team of highly skilled craftspeople design and build a wide variety of musical instruments and gear for worldwide distribution, including electric, acoustic, and bass guitars as well as boutique-style guitar amplifiers. The PRS SE line of products complements the Maryland-made PRS line by offering highly approachable and more affordable electric and acoustic guitars and guitar amplifiers. Carlos Santana, Neal Schon, John McLaughlin, Linkin Park, Orianthi, Opeth, Zach Myers of Shinedown, Mark Tremonti of Creed and Alter Bridge, Ricky Skaggs, Cody Kilby, Martin Simpson, Tony McManus, Warren Haynes, and Derek Trucks are among the artists currently playing PRS instruments and/or amplifiers. 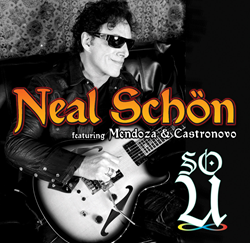 For more about Neal Schon, please visit: http://www.schonmusic.com.